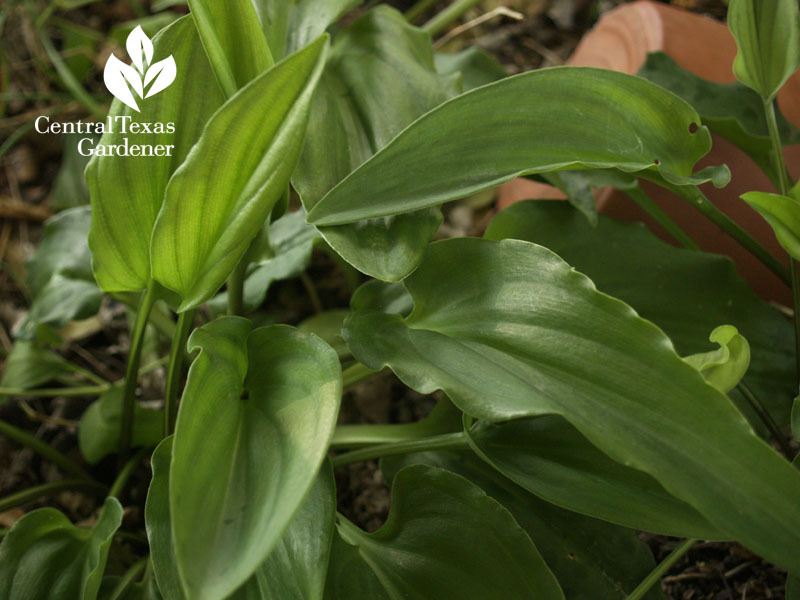 Fall into digging with exciting plants and a garden makeover! Ah, early renewal! Hot days aren’t over yet, but plants are as ready as we are to get back to work. Actually, skeleton-leaf goldeneye daisy never takes vacation. It handles my (composted) clay soil just fine, always looks good, and attracts beneficial insects with late spring and fall flowers. It would bloom in summer too, but it was a “tad dry” for me this round. This shot with Salvia greggii is at the Lady Bird Johnson Wildflower Center, but I made a similar match. 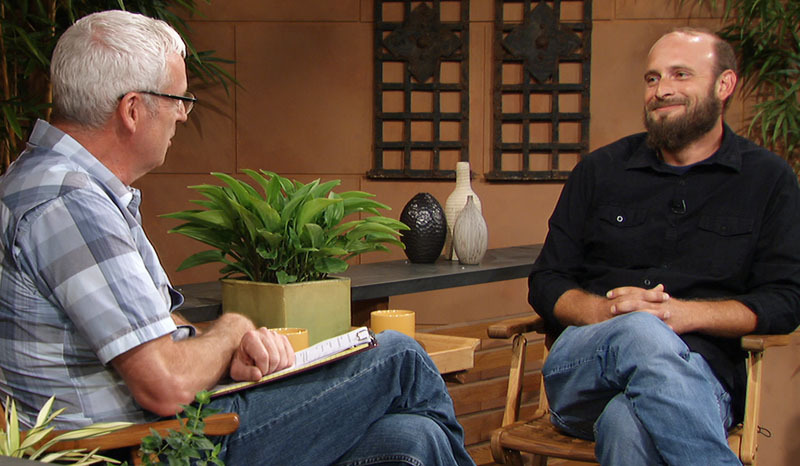 It’s on Nathan Unclebach’s short list, too, when he joins Tom this week. 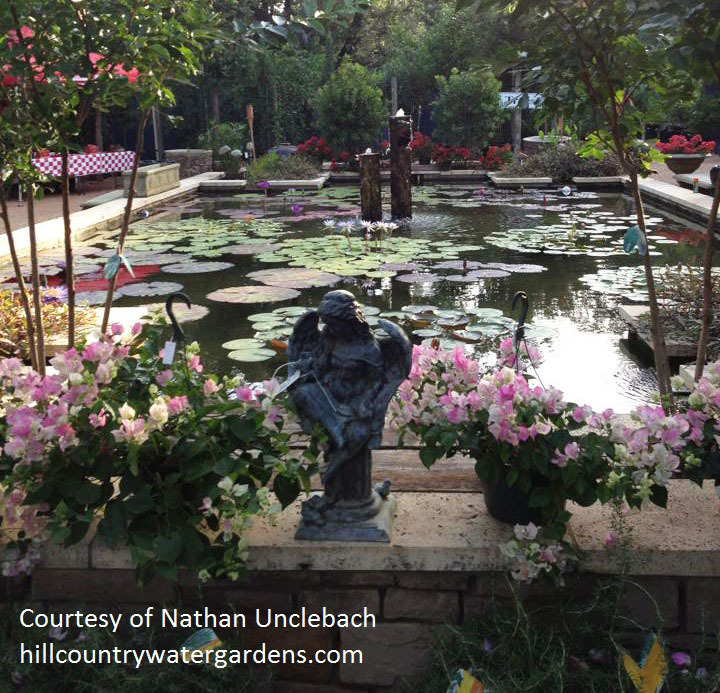 Perhaps you’ve met him at Hill Country Water Gardens & Nursery as a go-to guy to satisfy your garden hankerings. 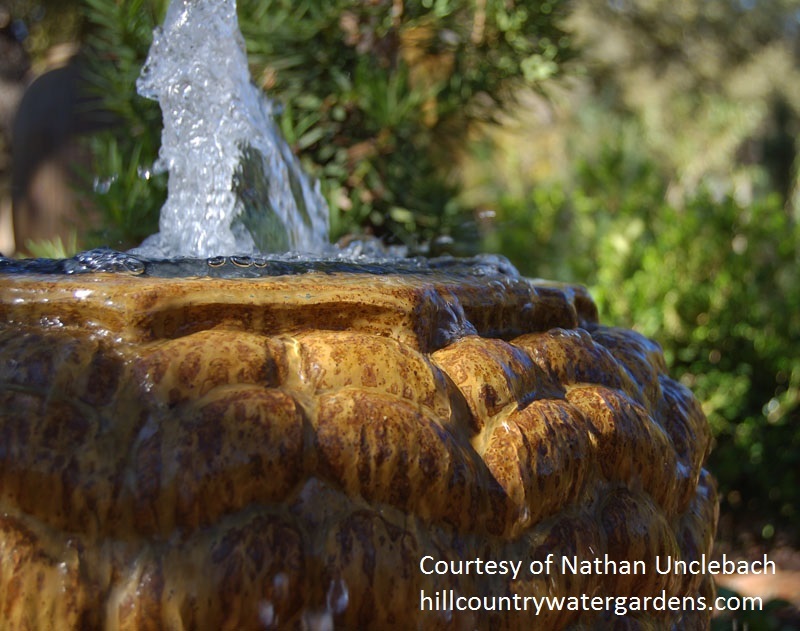 Sure, you know HCWG&N for ponds, fountains, and streams. They’ve also got unique landlubbers suited just for us. Since now’s primetime to put the pedal to the metal (shovel), Nathan banishes our summer blues. 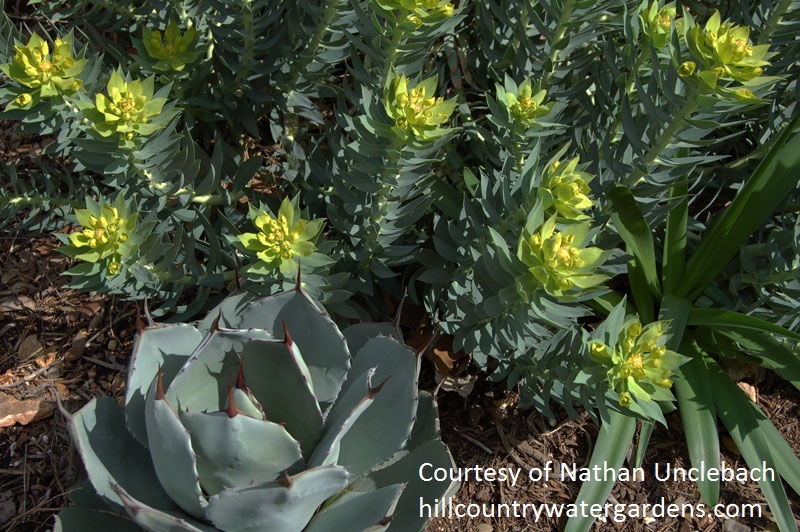 One he promotes in good drainage is Gopher plant (Euphorbia rigida) that pairs well with agaves, like this A. parryi. Great in containers, too. 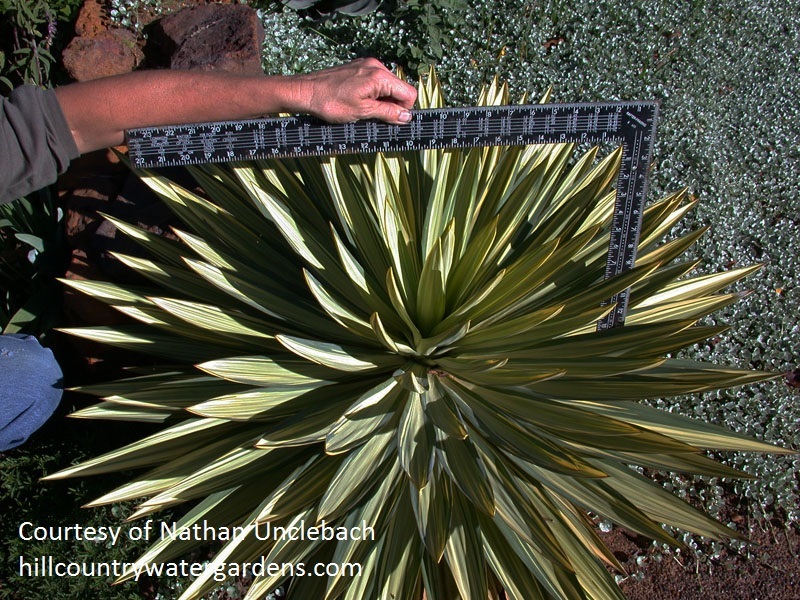 If you’d like a yucca but don’t have tons of room, isn’t this Yucca gloriosa ‘Tiny Star’ a cutie? Beyond is groundcover Silver ponyfoot (Dichondra argentea). 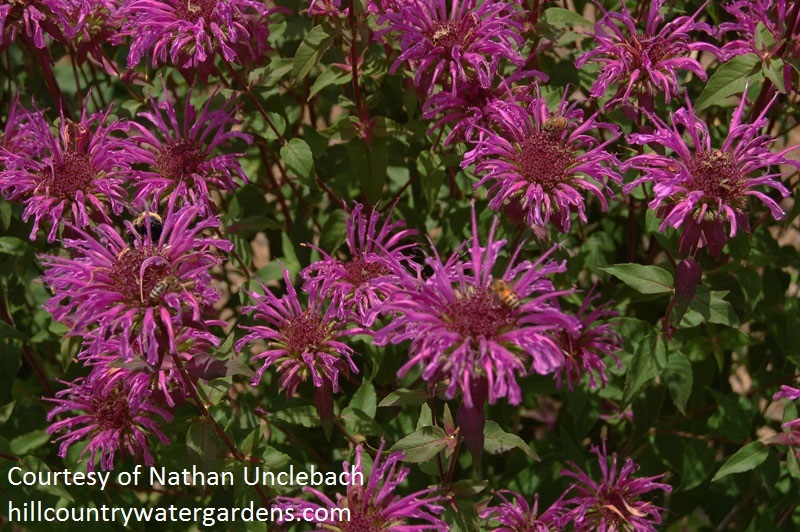 Peter’s Purple monarda (bee balm) is a perennial sensation. 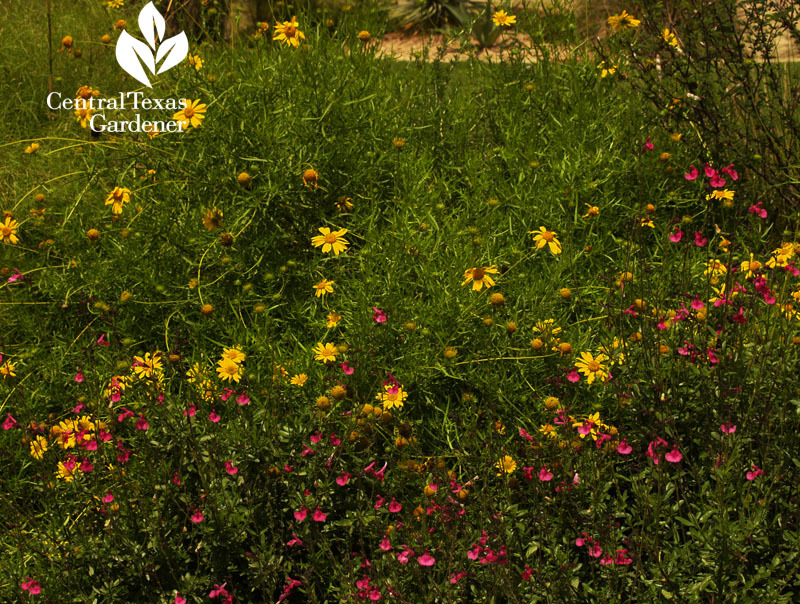 This guy’s tall—possibly hitting 4’—with vibrant late spring/early summer flowers that are irresistible to bees, butterflies, and hummingbirds. I’m planning to include some next to a silvery cenizo. Won’t that be a knock out? For shady spots, Nathan shows off African hosta (Drimiopsis maculata). I LOVE mine. They’re evergreen in protected containers. In the ground, they go dormant in winter, but return very fast. A bit of sunlight brings out their burgundy spots. In my case, it’s when they emerge in late winter and the deciduous trees send more sunlight their way. 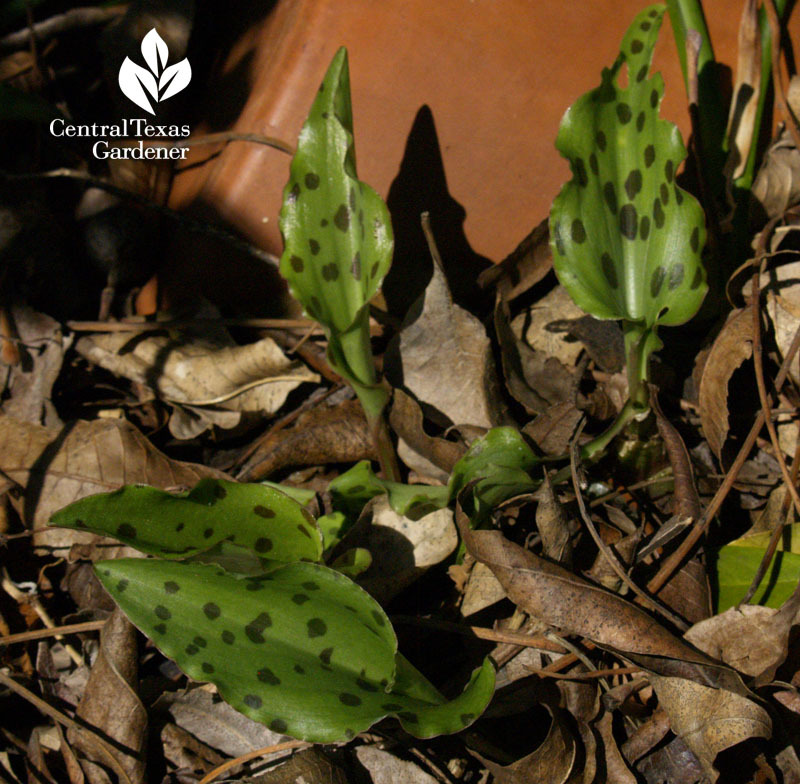 Their bulbs multiply fast and are easy to divide. And so drought tough. 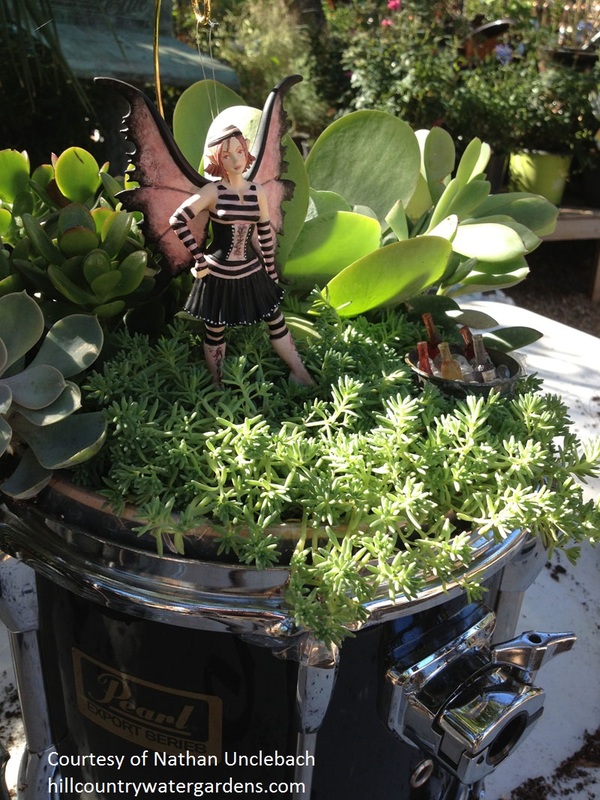 Here’s some of Nathan’s handiwork in a creative succulent container, perfect timing for the ACL Festival. Check out the little beer bottles, too. Nathan’s one for details, I’ll say that! But I think she is missing her wrist band. 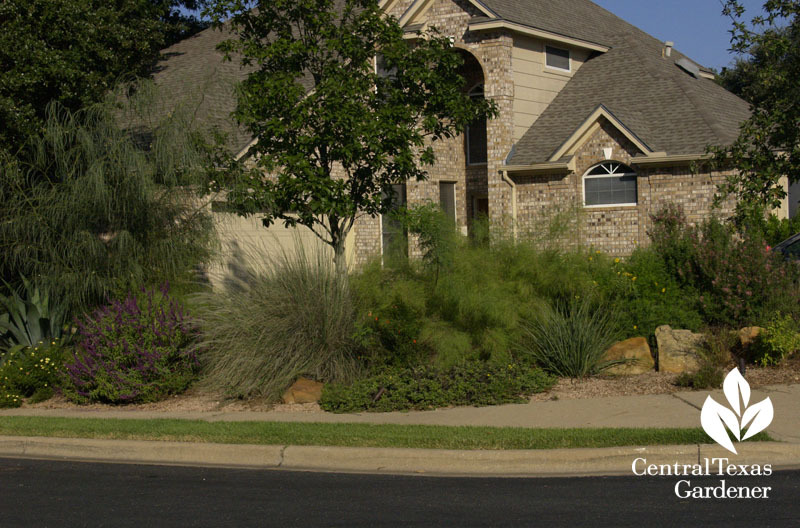 . .
On tour, see how creative designer Russell Womack turned around this 70s yard. 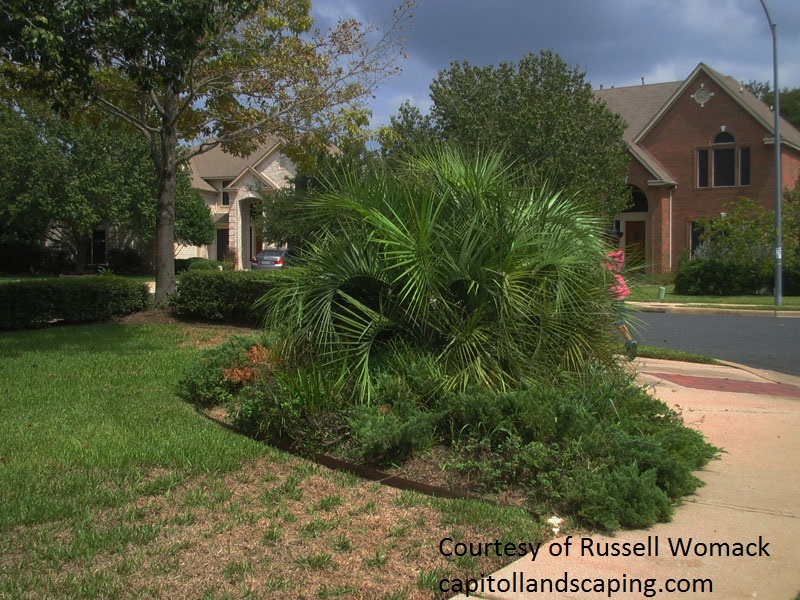 Along with breaking up forbidding barriers and dealing with drainage issues, he restored wildlife with drought tough plants. 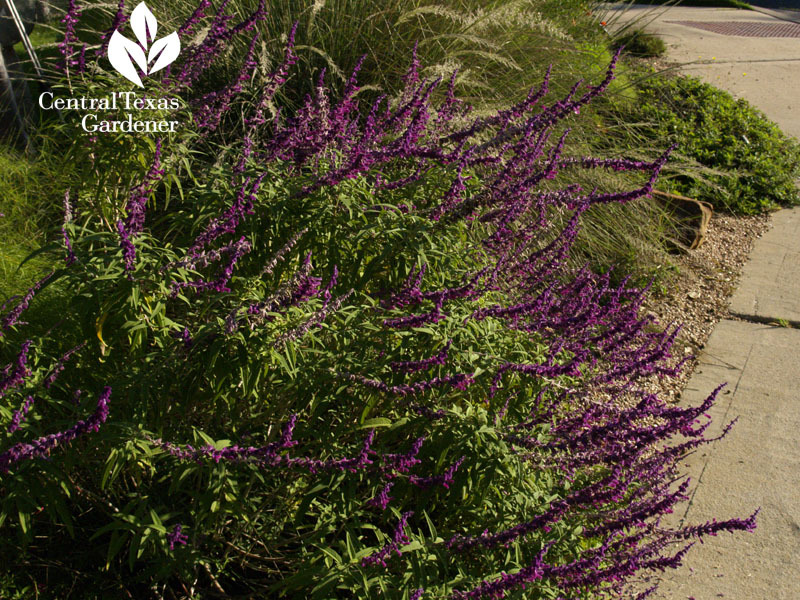 Mexican bush sage (Salvia leucantha), is an outstanding fall blooming perennial that you can plant now. 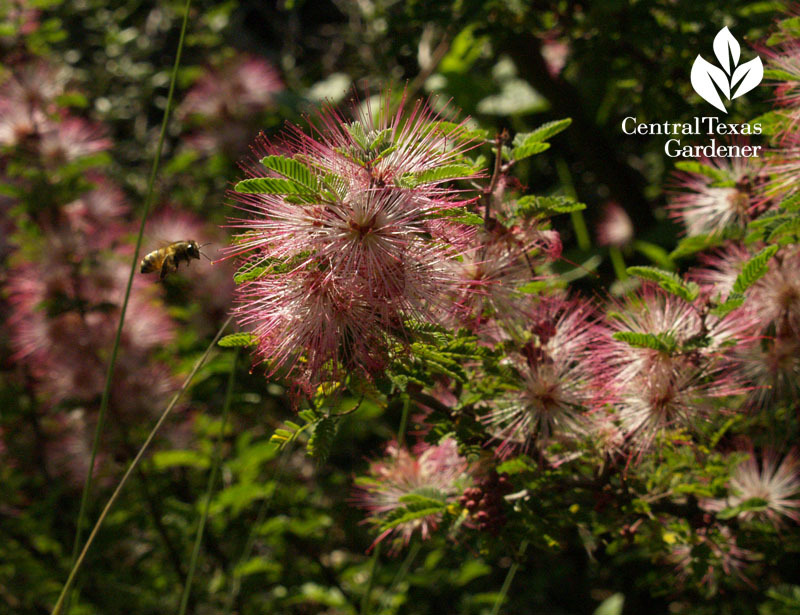 I absolutely love this native pink fairy-duster (Calliandra eriophylla) but I’ll admire this deer-resistant desert plant from afar. I tried it in my soil and it sent me a very mean exit letter (though it didn’t make a dancing video)! Sun and rockier or gravelly conditions: you’re good to go. Russell gave the back some depth and personality. Here we’ve got dwarf Mexican olive (Cordia), bamboo muhly, Salvia greggii, Bat-face cuphea and cotoneaster. 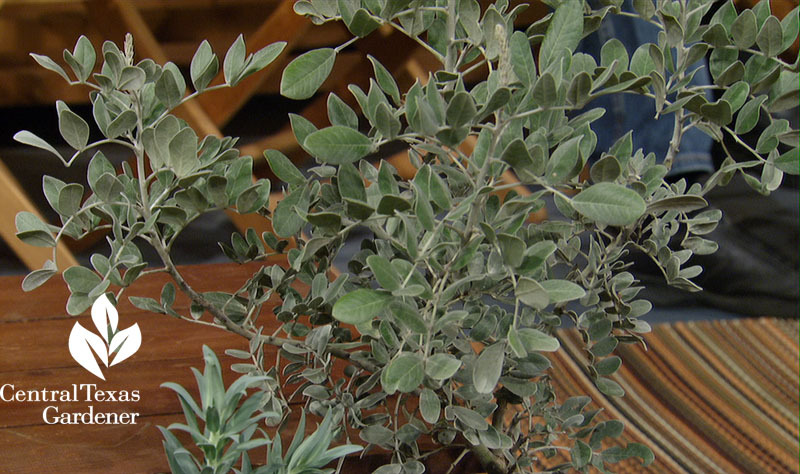 AND, here’s Russell’s plant list. Well golly, you’ve just got to see it all! In the vegetable garden, it’s time to plant garlic! 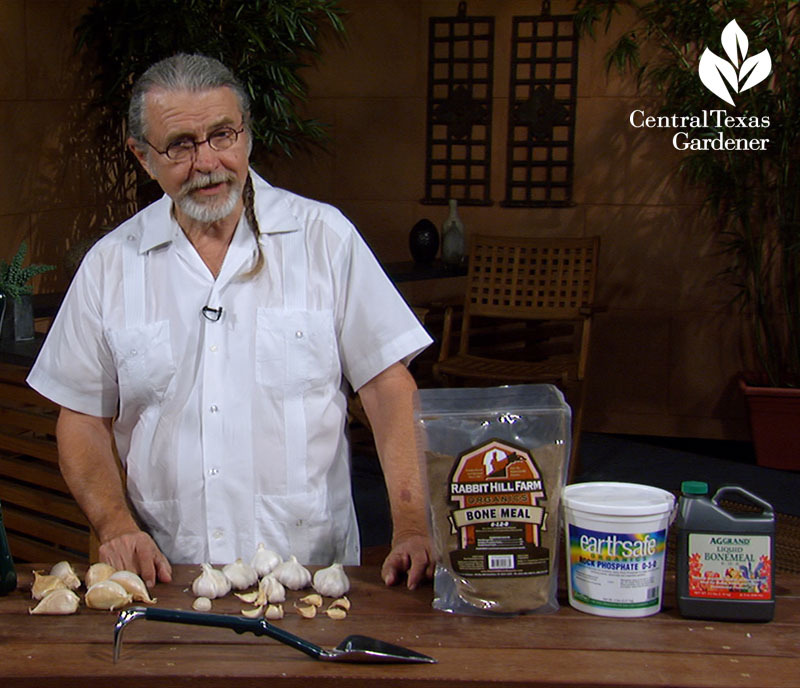 John Dromgoole shows how to do it, including elephant garlic, for a tasty sensation beyond supermarket versions. Daphne’s out of town this week, but she’d tell us: It’s time to divide your bearded iris. Cut off rhizomes that are rotting or have borer holes. Pluck off the young offsets to re-plant. 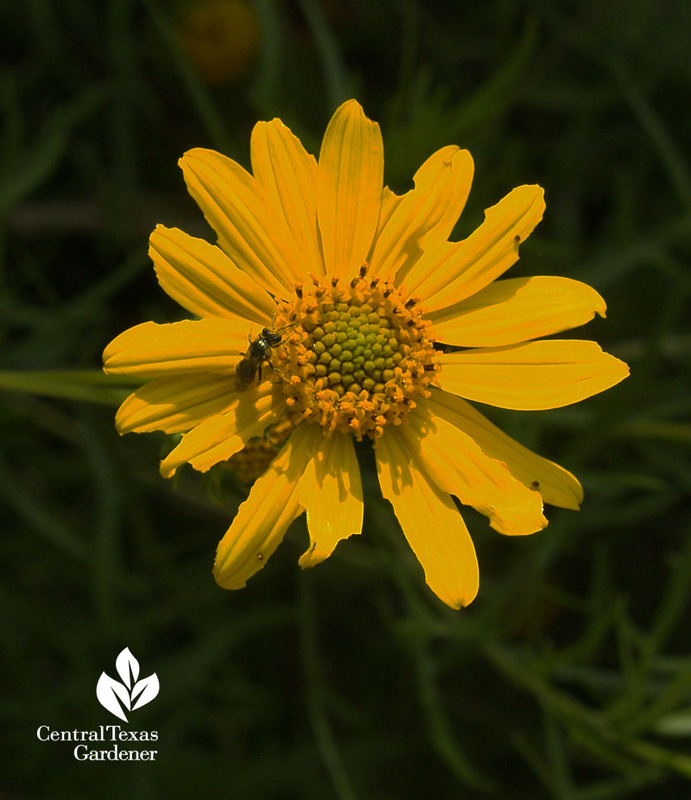 Lightly fertilize with a high phosphorous blend or bone meal to encourage beautiful blooms next spring! 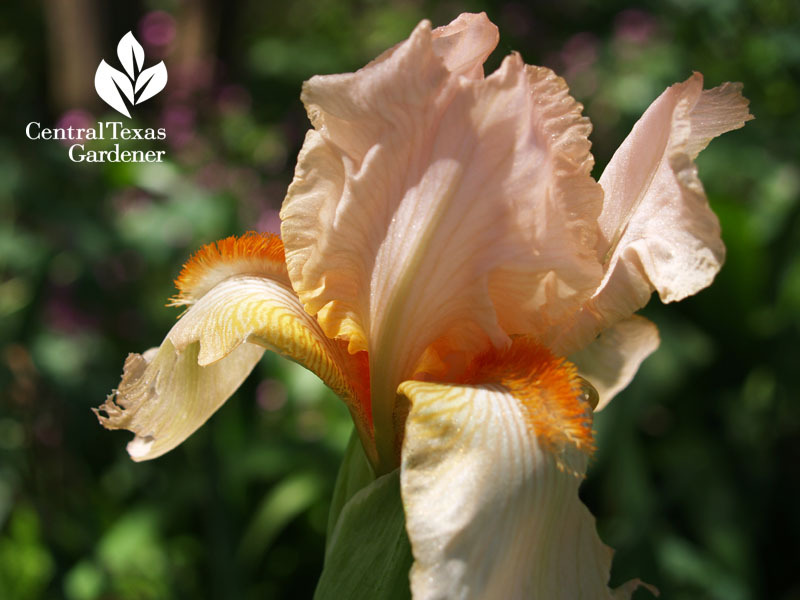 Here’s Trisha Shirey’s CTG video for how-to steps to divide and replant your bearded iris. ← Need ideas? 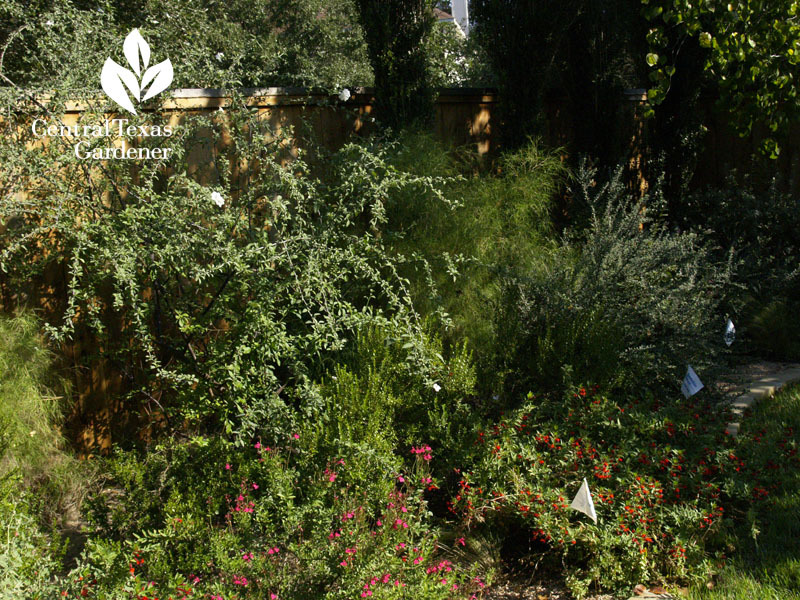 Get a jumpstart from the Garden Conservancy.